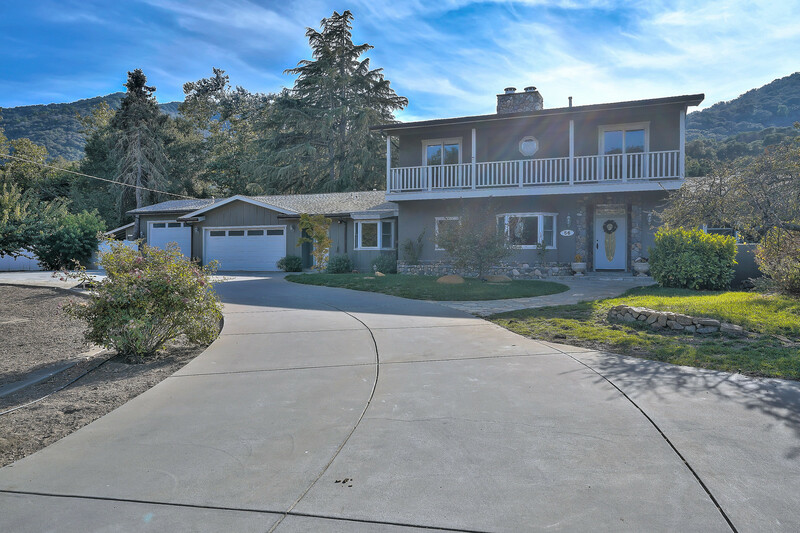 Contact Mark Bruno (831) 917-8190 with the Monterey Peninsula Home Team to see if this dream equestrian property in Carmel Valley is still available and to arrange a showing. Located just 12 miles from quaint Carmel-by-the-Sea, this completely custom-built Carmel luxury equestrian estate is the perfect home for the family that loves gatherings and equine pursuits. 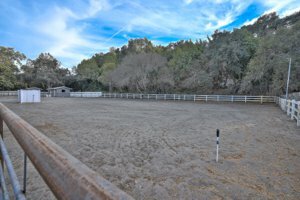 The 3+ bedroom, 3.5 bath Carmel Valley horse property sits on a flat 2.1+ acre lot that includes a horse arena, tack, feed rooms, and four horse stalls. The front of the Carmel Valley luxury home displays a charming Plantation-style balcony and ample front yard. Walking in the front door is entering a cozy, yet formal living room space with abundant light and a beautiful marble fireplace accented nicely by Craftsman-style wainscoting built-in shelving and half-wall in the adjoining dining room. The dining space also features hardwood flooring and a glass-etched skylight that has the capability to light up its exterior at night. 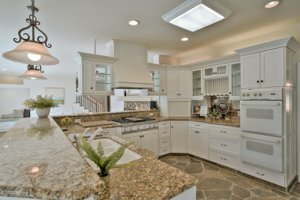 Completely renovated in 2002, the 3,879 square foot Carmel Valley luxury home for sale features radiant heat stone flooring throughout. A rarity in this mostly temperate climate, air conditioning is also an amenity for those warmer days. The kitchen, which conveniently looks out over the backyard of this horse property, includes the heated stone floor for early morning trips to the coffee maker. It also features custom cupboards, granite countertops, and a professional-grade Viking stove. The custom tile bronze backsplash melds well with the counter’s earth tones and the kitchen’s overall light and airy feel. It also includes a breakfast bar while the adjoining nook/eating area features a large window with craftsman style molding and another half wall of wainscoting. The window overlooks a direct view of the equestrian grounds and a garden shrub archway of this Carmel Valley equestrian property for sale. A built-in butler’s pantry is just off the kitchen with a spacious laundry room and washer/dryer hook-ups as well. Around the corner is a carpeted more rustic-oriented family room living space in view of the classic stairwell with spindle railing that leads upstairs to the master suite. Downstairs there is also a conveniently located mudroom for the just dismounted rider and those going in an out to the equestrian arena and horse stalls. It also includes a half bath with a class vintage claw foot tub. 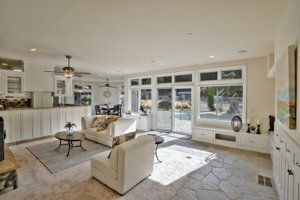 There is also an abundant storage room that can be utilized in a multitude of ways including as a wine cellar and a large guest suite with walk-in closet. The upstairs of this Carmel Valley luxury home for sale centers on a gorgeous master suite that’s spacious fully carpeted and includes its own fireplace, lofty ceilings and a sliding glass door that leads to an outdoor patio with views of the pristine property. It also includes a sitting room and a large walk-in closet. From this spacious sanctuary enter into a master bath that features a double sink vanity with marble counters, full-length mirrors, and marble tile flooring and a sunken tub, encased in marble framing. This Carmel Valley luxury equestrian property has an additional room connected to the master suite with its own sliding glass door that leads to an outdoor balcony is suitable to be used as a gym, nursery or office. Nearby, a brightly lit room with large corner windows that served as an office features a stone fireplace, hardwood floors and a dark wood shelving sectional, which provides that formal fell of an office environment. This room could also serve as another bedroom or nursery. Other upscale features in this beautiful country home and Carmel Valley equestrian property include a three-car garage (with the third garage stall separated) surround sound and a state-of-the-art central vacuum system. Located in a coveted neighborhood with other equestrian properties and amidst surrounding vineyards and rolling hills, this equestrian’s dream home sits on more than two acres. Because it’s completely irrigated, the Carmel Valley horse property could easily be designed to include a private vineyard for those wanting to dabble in winemaking or the more serious vintner. As you enter the back property a rustic stone chimney from the indoor fireplace is visible and a stone fire pit perfect for outdoor gatherings and get-togethers around the fire is built into the outside patio. Exterior features include reinstated copper rain gutters and lighted grounds. The four horse stalls all conveniently have electricity. There’s both a tack and hay room that allow for horses to be washed and are also conveniently located with gate access to the driveway for loading and unloading. It also provides good horse trailer access. There’s also room for extra trailer parking. Overall, this serene and secure Carmel Valley equestrian property is designed very strategically and sits on a rare piece of level ground for its size. The Carmel Valley luxury home for sale is also located in the coveted Carmel Unified School District and close to the Carmel Valley Trail and Saddle Club that encourages equestrian activities of all kinds. There is also easy access to Garland Ranch Regional Park and its myriad nature trails. That’s while still being close to the quaint Carmel-by-the-Sea and the plethora of attractions and amenities of the other Peninsula cities. Just a short drive from Carmel-by-the-Sea, Carmel Valley offers the beauty of green rolling hills, pastures, and grapevines. Tucked away in this area known for its sunlight, vineyards and wine-tasting opportunities are some unique luxurious real estate opportunities including spacious custom estates and sprawling equestrian properties. It’s the perfect location to leave all the stresses of city life behind and feel the comfort of the country life, but still be close to restaurants and other needed amenities. 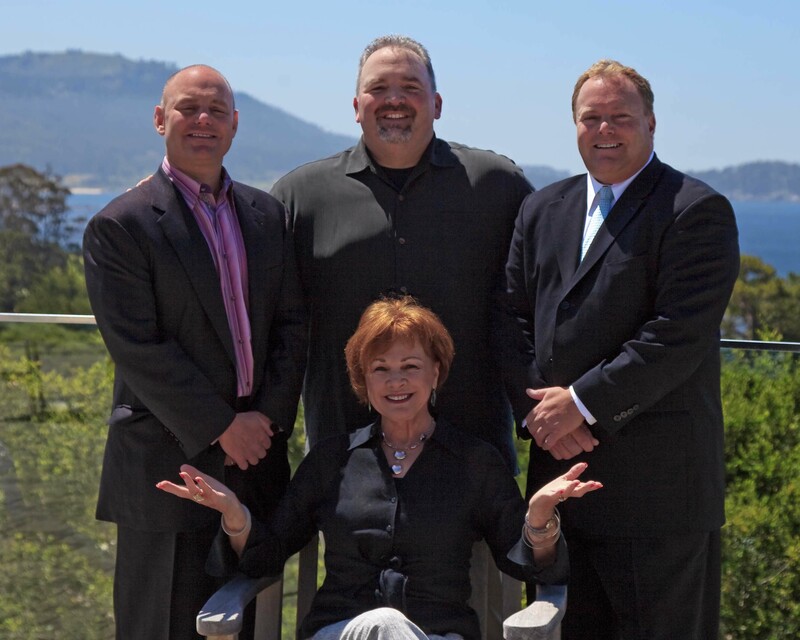 Search for other Carmel Valley luxury homes like this one.